1. It’s happening now. Climate change is already affecting our planet. Ice is melting. Sea level is rising. People are migrating. Fresh water is becoming contaminated with sea water. Species are dying. Extreme weather events are increasing. This image was taken at the North Pole, in July 2013. – Thermal expansion: As water heats up, it expands. Around half of the sea level rise of the last century is due to this. – Melting glaciers: Recent higher than average temperatures have resulted in more melting than normal. This, coupled with lower than average snowfall during the winter months has resulted in net gain in the ratio of surface run-off to evaporation. – Melting of Greenland and West Antarctic ice sheets: Since 2002 the Greenland ice sheet has lost an average of 287 billion metric tons of ice per year. 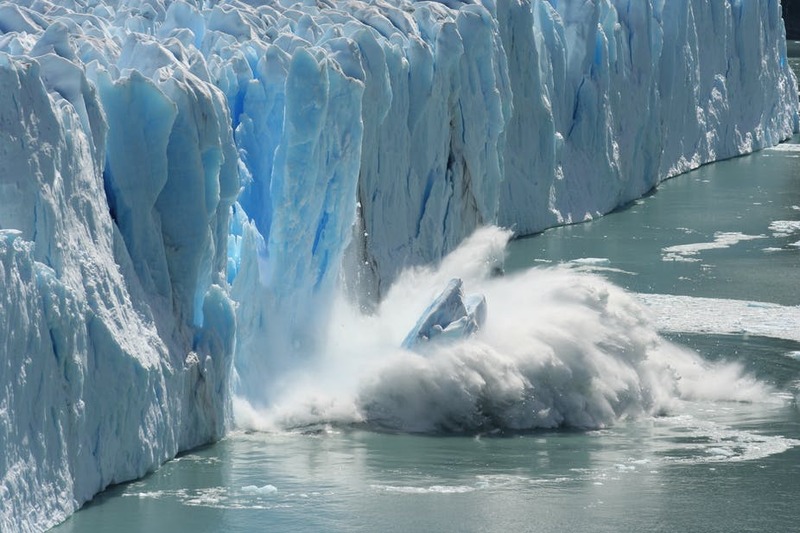 Higher sea temperatures are causing the ice sheets to melt from below, weaken, and break off. 3. Climate change is because of us. Not the El Niño effect, or any other excuse. Solar cycles are 11 years in length, whilst volcanic eruptions sporadically cool the planet, but no natural cause explains the half-century warming trend. The continuous rise in the average surface temperatures correlates with the rise in carbon emissions. 4. Gases have different relative contributions to climate change, otherwise known as their global warming potential (GWP). Methane has 56 times greater GWP potential over 20 years, compared to CO2; and nitrous oxide has 280 times the GWP of CO2. As a result, relatively low levels of methane and nitrous oxide are very damaging, with the agricultural industry playing a large role in this. 5. If we are going to stay within our agreed limit of 2°C rise, 82% of fossil fuels already known to exist must REMAIN IN THE GROUND. We have the technology to allow this. Alternative sources of sustainable energy are now serious contenders to be our primary energy source. Solar energy is now the cheapest source of energy in more than 30 countries, as a result of technological progress and economies of scale. The UK can proudly say it has the largest wind turbine in the world in operation off the Merseyside coast, the site comprises of 32 turbines which have the capacity to generate power for 230,000 homes. 6. Climate change influences plant breeding seasons. Have you noticed the seasons changing from year to year? Flowering seasons of plants are affected by human-caused climate change. Historic records from Japanese festivals celebrating the blossoming of cherry trees have shown that they are now blossoming earlier than any point in the last 1,200 years of record keeping. Changes in plant breeding seasons can have a secondary effect on the entire food chain, including pollinators, influencing survival rates. 7. Climate change impacts food availability. Climate change will have some positive effects on agriculture, though the net effect will be negative. Rising carbon dioxide levels would theoretically boost yields of crops such as wheat, soybean and rice. However, unpredictable and more extreme weather events associated with climate change is damaging our crops. An example of this is the recent flooding in Murcia, Spain, the heaviest rainfall for 75 years. 80% of UK winter crops are imported from this region. Flooding meant shortages of common food items such as salad and broccoli in supermarkets across the UK, and prices increased when the products did become available. 8. Climate change is having a huge impact on wildlife. Plants and animals are being driven to extinction because of climate change. Rising temperatures drive populations from their geographical limits; those already at their upper limits e.g. existing on mountains, are going extinct. For example, the giant mountain lobelia (Lobelia rhynchopetalum) a plant native to Ethiopia. Scientists predict that they will be able to survive on only 3.4% of its current habitat by 2080. Across the world, coral reefs are bleaching and dying (see image below). Staghorn coral (Acropora cervicornis) has declined up to 98% in the Caribbean since the 1980s. There are benefits for some species, such as humpback whales that are taking advantage of the ice-free waters off Antarctica. Overall however, species diversity and ecosystem complexity is decreasing dramatically. 9. Climate change has a social element as well as an environmental (and economic). An average of 27 million people are displaced by climate and weather-related disasters each year. These people are known as climate refugees or environmental migrants. Both images are taken in Somali which his been hit by drought, preventing crop growth and pasture for animals, followed by flooding which displaced over 100,000 people. 10. We have the ability to minimise the impacts of climate change. The world’s biggest problem attracts the world’s greatest minds to solve it. In 2015, 195 countries signed the Paris Agreement, pledging to keep global warming below 2°C. There are MANY actions that we can take as individuals, here are some simple tips you can incorporate into your life to reduce your carbon footprint.